Superb keyboardist and driving mind of the British jazz funk scene, founder of the seminal and finest band called Atmosfear, Mr. Lester J. Batchelor is also the composer behind these three timeless gems and most refined eletronic disco tracks as Equa. This is an istant buy if you like the style of Motorcity Drum Ensemble, Sadar Bahar, Red Greg and (most famously) Piccadilly allstar Kickin' Pigeon! Matt says: Here it is folks! 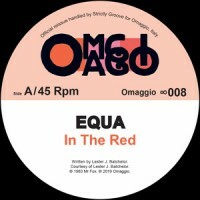 The top tune off that "In The Red" comp on Chuwanaga (duh - the clues in the title! ); and if we're being honest, the sole reason behind the release. Now we get our filthy mits on a whole side, 12" pressing, plus two sick AF tracks on the flip! "In The Red" blows up EVERY TIME people - do not miss out!